During DNA relationship testing, shared DNA markers are compared between the tested individuals. A full match of these markers between individuals provides evidence of a relationship between them. Each DNA marker is represented by two numbers. 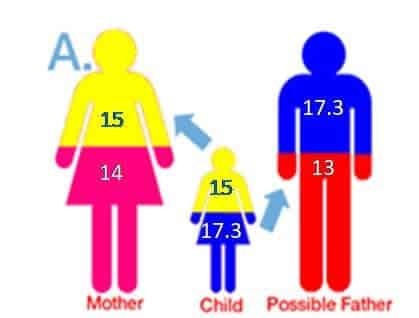 For example, in the case of paternity testing, if a father displays numbers 13 and 17.3 for one specific genetic marker, the child will need to display either the 13 or the 17.3 on the same genetic marker to show it has been inherited from the father. An electropherogram (EPG) is a graphical representation of the DNA profiles of all tested individuals. A technique known as capillary electrophoresis is used to allow the DNA profiles to be viewed in this way. An example EPG is shown below. In the case of relationship testing, each marker will have two alleles (one from each parent). The DNA markers (alleles) may be the same length and will appear as a single peak (e.g. example 1: D3S1358) or they may be different lengths and will appear as two separate peaks (e.g. example 2: D1S1656). When purchasing your test, you will be given the option to also order your DNA technical data or an electropherogram. These are emailed across with your DNA profiling test report. A hard copy option can also be purchased on the Order Form.